Hi all. Fancy me writing again today! I was surfing the interweb and came across a very interesting article titled 'Dying Mother's List Becomes Bestselling Book'. The article was basically about Kate Greene and her family and how she struggled with cancer and left this earth a little too early. Before he departure, she basically wrote a list for her husband and sons and her husband, St. John Greene. Her husband published the his wife's list as a love letter to her and since then he has been trying to go through the list with his sons. Some of the things that Greene and his sons have done are visiting Egypt and seeing the pyramids, snorkling in the Red Sea and skating in the Natural History Museum in London. 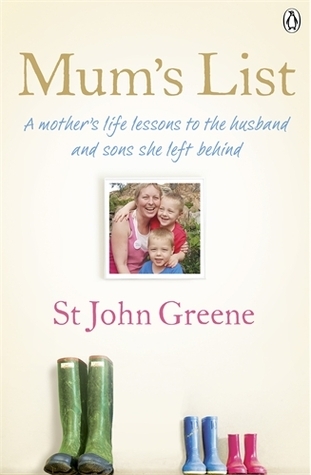 The book is titled "Mum's List: A Mother's Life Lessons to the Husband and Sons She Left Behind " and is a book I would like to read but am afraid of reading. It will surely make me weep. I reckon this is also the kind of story that could change your life for the better. So, if you have read the book, do let me know how it goes. Btw, a movie tie-in is in the works.